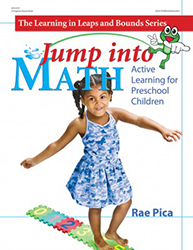 Jump into Math is the perfect way to turn children's love of active games into learning opportunities! The activities in each chapter are organized by level of difficulty, and each one incorporates fun, exciting math experiences with movement. Most activities require few or no materials and include related children's books or music to extend the learning. The math skills index is an invaluable reference tool, giving teachers flexibility to plan around children's interests. Whether you use these lively math activities during circle or group time, substitute them for more traditional lessons in math, or use them to reinforce other lessons, you can be sure that the children are moving in leaps and bounds toward understanding mathematics. Research shows that the most effective way for children to learn concepts is to experience them physically. Jump into Math offers just this kind of learning. Activities such as Light and Heavy Words, The Number Hunt, and Three-Legged Creatures will actively engage children as they explore new math concepts!